the Cleveland Indians won over 100 games this season, 102 to be exact, for only the second time in franchise history and first time since 1954. they were the favorites to win the American League pennant and many predicted them to win the World Series as well. unfortunately, to every Tribe fan's dismay, they didn't even make it out of the Division Series. so while the 2017 regular season was exciting and filled with highlights, the postseason was crushing. now i'm here to give you a final recap of the Tribe's year and my annual player evaluations. and i want to apologize for posting this later than i would have liked. once i started going back over all the players' seasons and postseasons, i realized there was quite a lot to cover and i needed to make sure i included all the big and important stuff. i was very thorough and i hope you enjoy my analysis! have the detailed player evaluations further down in this blog, i kept this section team-oriented. the Indians had six walk-off wins this season. their first was a walk-off in the 10th inning of the Home Opener versus the Chicago White Sox on April 11. the second came on July 22 in the 10th inning versus the Toronto Blue Jays. walk-off #3 occurred a few days later on July 25 versus the Los Angeles Angels in the 11th inning. the next one took place on August 8 in the 9th inning versus the Colorado Rockies. after that, they walked off in the 9th inning on August 21 versus the Boston Red Sox, and finally versus the Kansas City Royals on September 14 in the 10th inning. Joshua Dakwar put together a fantastic video on his youtube channel with all the walk-offs; check that out for more details on who the heroes of the games were and what they did at the plate. his video also featured the Tribe's one walk-off win in the American League Division Series on October 6 versus the New York Yankees in the 13th inning. the longest losing streak suffered by the Tribe this season was four games, when they lost the last game before the All Star Break on July 9, then got swept coming out of the break by the Oakland Athletics in three games from July 14-16. they had several three-game losing streaks this year, but just the one four-gamer. prior to this, the Indians had not lost that many games in a row since July 23-28, 2015, in which time they were the losers of six straight. after losing five of their first six games following the All Star Break, the Indians went on a 9-game win streak between July 21-29. they swept the Blue Jays at home, won a makeup game versus the Cincinnati Reds at home, swept the Angels at home, and won two games on the road against the White Sox. the Indians wrapped up Interleague Play this year on August 9 and finished with a 6-14 record against National League opponents in 2017. this was their biggest regular season struggle, i'd say. here's a list of which NL teams they played and how did they: Arizona Diamondbacks, 0-3; Reds, 2-2; Los Angeles Dodgers, 1-2; San Diego Padres, 1-2; San Francisco Giants, 1-2; and Rockies, 1-3.
on August 19, after beating the Royals, the Indians became the only team in Major League Baseball to have three 12-game winners in their rotation. within that 22-game win streak, the Indians also won 11 consecutive games on the road between August 28 and September 7 after beating the Yankees, Tigers, and White Sox. it was the first time in club history that they ever went 11-0 on a road trip! the Indians claimed their second straight AL Central Division crown on September 16 after the Blue Jays beat the Minnesota Twins, eliminating Minny from the race. 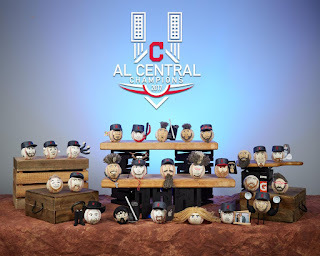 the Indians were already at their homes and not at the ballpark because their game had taken place earlier in the afternoon, so they celebrated on the field in front of fans the next day on September 17. all the details from those festivities can be found in my separate blog, The Indians Are the 2017 AL Central Division Champions! the reason the Tribe won their division is because they had great success when facing each of their divisional foes. in fact, they essentially ran away with the division once the 22-game win streak began taking shape, and finished with an astounding 17-game lead over 2nd place Minnesota! individually, the Indians had a 13-6 record against the Tigers, 12-7 record against the Royals, 12-7 record against the Twins, and 13-6 record against the White Sox in 2017.
the Indians set another franchise record on September 24 when they won their final road game of the season against the Seattle Mariners, giving them 53 road wins overall. all year long, pitchers Trevor Bauer and Carlos Carrasco had a side project going on during games in the dugout. 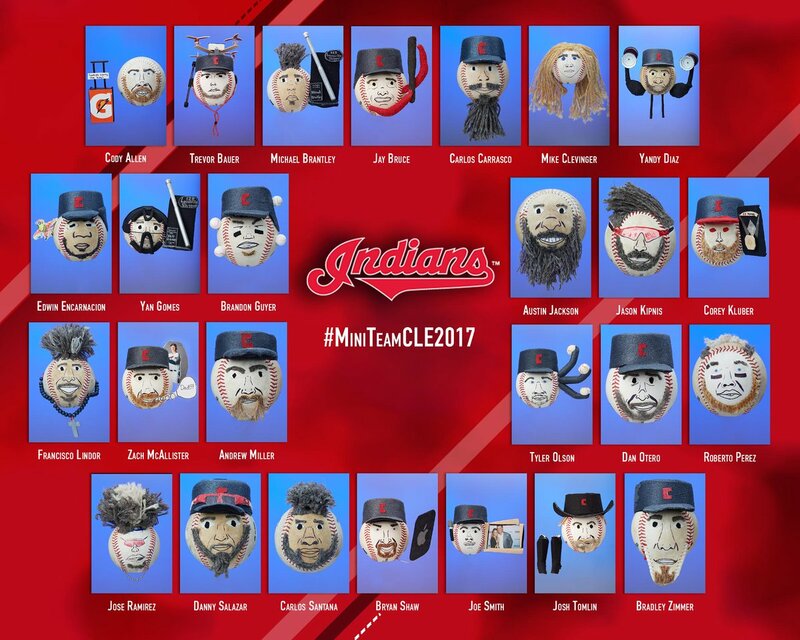 as long as the Indians were winning, the two would create mini baseball replicas of every player on the team, using only items they found in the dugout or clubhouse. by season's end, they had an entire mini-ball team that bore such an accurate resemblance to the real thing, it was unbelievable. 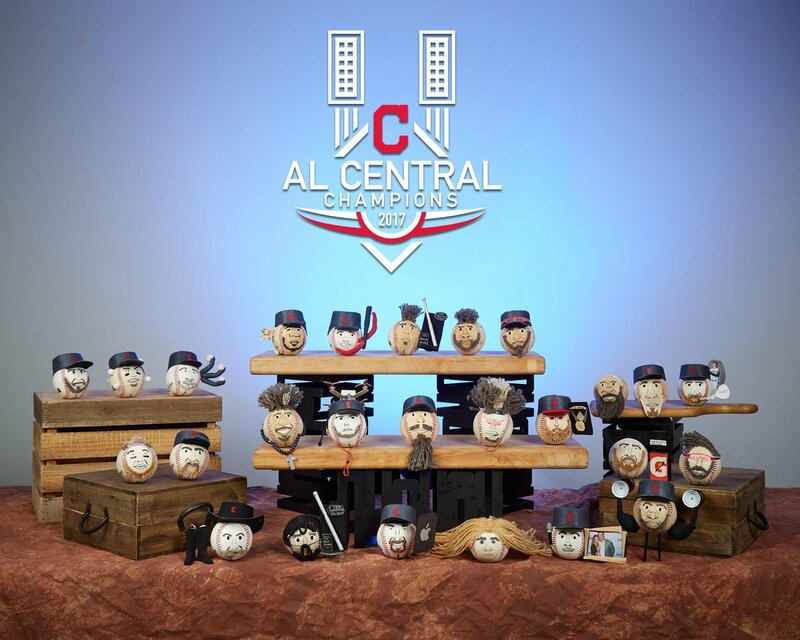 on September 29, the Tribe gave away a limited supply of mini-ball team photos to fans. the Indians ended 2017 with 11 straight series wins. they swept the Royals (August 25-27), swept the Yankees (August 28-30), swept the Tigers (September 1-3, four games), swept the White Sox (September 4-7), swept the Orioles (September 8-10), swept the Tigers again (September 11-13), won three of four versus the Royals (September 14-17), swept the Angels (September 19-21), won two of three against the Mariners (September 22-24), won two of three versus the Twins (September 26-28), and won two of three versus the White Sox (September 29 - October 1). 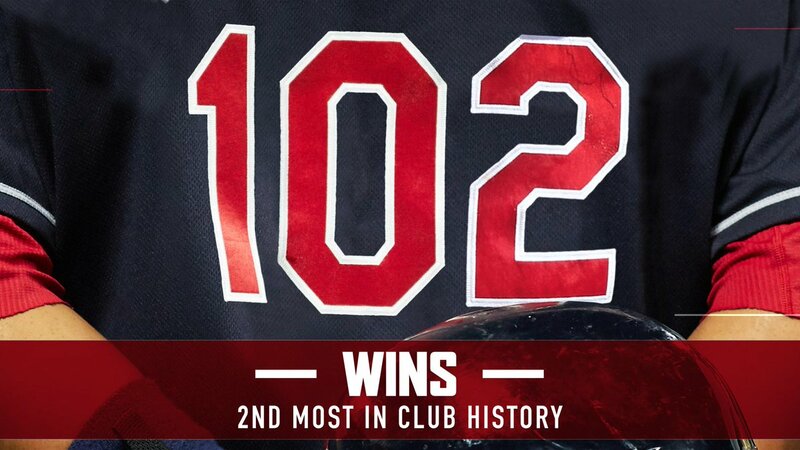 on October 1, the Indians defeated the White Sox in their final game of the season to give them 102 wins for the year! 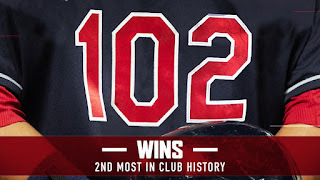 it was the second most wins in Tribe history, as only the 1954 team had more victories with 111. --offensively, the team finished 2nd in the American League with 574 extra base hits, 333 doubles, 604 walks, and .263 batting average. --offensively, the team finished 3rd in the American League with 818 runs and 2,476 total bases. --Indians batters also struck out 1,153 times, the 2nd fewest in the American League. --defensively, the team had the highest fielding percentage (.987) and fewest errors (76) in the American League. --Indians pitchers had a combined 3.30 ERA, the lowest in Major League Baseball. --the Tribe allowed 564 runs in 2017, the fewest in Major League Baseball. did i leave anything out that you feel should have been cited here? let me know in the comment section! 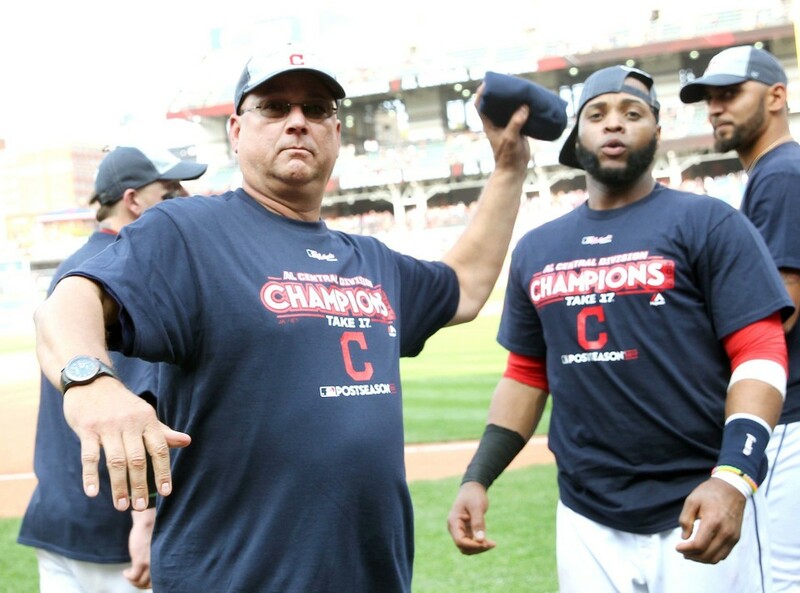 Terry Francona led his squad to a phenomenal 102-60 record this year, the second best record in the Major Leagues. only the Los Angeles Dodgers did better, going 104-58. the Tribe's 2017 campaign was also Tito's personal best record in both his five years with the Indians and in his 17 years so far as a manager. but it was not all smooth sailing for the skipper this season. Tito dealt with some serious health scares midway through yet made a seemingly quick recovery. it started on June 13 when Francona left the game versus the Dodgers early and went to the hospital. bench coach Brad Mills took over the managerial role for the rest of the night. the team said Tito was light-headed and the doctors determined he was dehydrated. he returned to his post the following day. on June 26, Francona had to leave during the game versus the Texas Rangers. this time it was announced that he left with light-headedness and a rapid heart rate, which he again went to the hospital for. several tests ruled out any major health issues, but he was required to wear a heart monitor for a few weeks and push a button whenever he felt his heart racing. he was released from Cleveland Clinic on June 27, but did not manage that night's game. Mills took over again and Tito came back on June 28.
prior to the game on July 4 versus the San Diego Padres, Indians President of Baseball Operations Chris Antonetti told reporters that Francona had been admitted to the Cleveland Clinic for additional testing and would not be managing the night's contest. Antonetti continued to explain that the doctors were trying to narrow down what was causing Tito's symptoms and that he could be away from the team for a day or two. Francona went on to miss the July 5 and July 6 games versus the Padres before news came out that he underwent a cardiac ablation in the afternoon of July 6. the heart procedure was done to correct an irregular heartbeat. Francona was discharged from the hospital on July 7, but the team specified that he would not be rejoining the Indians until after the All Star Break on July 14. an unfortunate consequence of this meant that Tito would also be unable to manage the American League in the All Star Game, a privilege he earned because the Indians won the AL pennant in 2016. Mills managed all the games he missed with the Indians up to the break, as well as the AL All Star Team (who won the game, 2-1, in 10 innings) in Tito's absence. Francona did meet the team out in Oakland for their first series following the break against the Athletics, and he didn't miss another game.👍 this was also around the time that the Indians finally found their groove and started stringing together more wins than losses after a rocky, up-and-down, mediocre first half. it was a very good thing that Tito got his heart strong again because he uses it often as a manager, or more accurately, player's manager. but maybe he shouldn't have depended on it so much regarding what i'm going to talk about next. every manager makes debatable decisions at different times during a season, but Francona got some of the blame for what happened in the postseason. he made a few unpopular choices with many of the Tribe's fandom, beginning with the players he selected to be part of the 25-man American League Division Series roster. first off, fans disliked the makeup of the bullpen. they questioned why reliable relievers Dan Otero and Nick Goody were left out. Francona confessed it was difficult to tell them they wouldn't be making the roster, but also believed having starters Mike Clevinger and Danny Salazar in the bullpen was the better option. then of course there was the starting rotation debacle. why did Francona allow Trevor Bauer to pitch Game 4 on short rest? why didn't he keep Josh Tomlin as the starter instead of using him out of the bullpen in a previous game? and if he knew Corey Kluber was battling something, whether a recurrence of back pain or another issue, why did he let him start two games? i admit i was pretty upset myself with many of these things and shortly after the loss, i took out my anger in a What Went Wrong for the Cleveland Indians in the 2017 ALDS blog that held Tito accountable and used him as a scapegoat. how do you think Tito did this season as the skipper? leave your thoughts in a comment below! note: the rest of this blog contains several paragraphs that are italicized. those symbolize some of what i wrote in my Indians Spring 2017 Recap, Player Evaluations, and Predictions blog once spring training ended before the regular season began. if you don't want to (re-)read those excerpts in the Analyzing the Players section further down in the blog, feel free to skip some or all of them and just read the actual player evaluations. i like to include the blurbs here for reference, but be advised they do add to the length of this post. now let's see how i did with my preseason predictions regarding the Tribe's record, playoff matchups, and what i thought was going to be an advantage for us this year that we did not have one year ago. if everyone plays to their maximum capabilities and we don't have to endure too many serious or persistent injuries, then i think this team as currently constructed will have a win-loss record of 92-70. honestly, the Indians are a shoo-in to win the AL Central Division. that's not me being cocky, that's me logically looking at the other teams in the division and realizing that everyone else is facing some problems. i believe we'll own the Central. so i think it was an easy call to predict that the Indians would win the division, though for most of the season they did not have a comfortable lead in 1st place. that didn't come until the last month of 2017, when they were in the midst of that extraordinary 22-game win streak. but i never ever would have thought to predict over 100 wins, which undoubtedly came to be as a result of that streak. both our pitching and hitting were clicking at the same time and so on point. it was an outstanding regular season performance and i have never been so happy with being wrong. the ALCS matchup i'm seeing this year is Cleveland Indians vs. Boston Red Sox. i have to go with the biggest favorites here. sorry to everyone else in the American League, your season is gonna be irrelevant. and i'm undeniably drinking the Kool-aid because i am actually predicting my Cleveland Indians to be the AL Champs again and return to the World Series for the second straight year. i'm not saying it's gonna be a cakewalk though. this series winner may not be crowned until Game 7.
the NLCS matchup is harder for me to decide because i'm not as familiar with National League teams as i am AL. but after thinking about it for a while, i have chosen the Chicago Cubs vs. Washington Nationals. i think this series will go at least 6 games, and while i am very tempted to pick the Nats here, i genuinely believe the Chicago Cubs will be the NL Champions again. not even close. more apologies to the Los Angeles Dodgers. okay, so maybe it's a little boring or unlikely that both the Indians and Cubs will return to the Fall Classic. after a change in the Collective Bargaining Agreement, the All Star Game no longer designates home field advantage, so it doesn't matter if the AL loses that game in July. while i don't have a prediction for what the Cubs' win-loss record will be, i do foresee them accumulating more wins than the Tribe, giving them the advantage this year. nevertheless, i don't view that as a key factor: i'm picking the Cleveland Indians to win the World Series in 6 games! while the Cubs did at least advance to their Championship Series, they were no match for the Dodgers. they say it's very difficult for a team to return to the World Series the next year after being in it, and clearly the Indians and Cubs are more proof of that. btw, Sports Illustrated has predicted a Los Angeles Dodgers-Cleveland Indians World Series with the Tribe coming out on the losing end once again. how did your preseason predictions pan out? let me know if you fared better than i did in the comments. --Encarnacion's bat. i'm banking on this guy hitting at least 35 homers and driving in close to 100. --Andrew Miller in the bullpen for the entire season. those Ks are gonna add up quick. --Carlos Santana being in his walk year. sometimes that's all it takes for a player to be at the top of his game. --Yan Gomes back healthy. fingers crossed. basically any production we can get from the catcher's position is a bonus. --Michael Brantley. if his August surgery eliminated all his shoulder and biceps pain, then this gives us a huge advantage. i was definitely right on like two and a half of these. Encarnacion did what he was expected to do, finishing the year with 38 home runs and 107 RBI. while Miller was on the team for the whole season and totaled 95 strikeouts, the Tribe lost him to a knee issue for most of August and almost half of September. it seemed like Santana was putting too much pressure on himself at first in 2017, but he became much more effective in the second half, which he has a tendency to always do. Gomes had his ups and downs with his bat, but between he and Roberto Perez, 94 RBI came from Indians catchers this season. and lastly, Brantley. his shoulder and biceps problems are a thing of the past, but lamentably, he developed a new condition with his right ankle, missing 60 games and leaving two games early because of it. i'm gonna get into all the specifics of each player in a little bit. ordinarily, the Indians experience a barrage of roster moves throughout a season, causing several players to be designated for assignment/casualties of new additions. this year, however, the team managed to get back everybody they DFA'd. that's very rare, but i'm sure the players were pleased. the only strange case was that of Daniel Robertson. he was DFA'd on August 10 to make room for Jay Bruce on the 25-man roster, then was released and re-signed to a minor league deal on August 16. but by September 1, the Indians reported that Robertson opted out of his contract and became a free agent. if he did that, then i don't see him rejoining the Tribe again in the future. Carlos Santana's contract with the Indians, the one he signed in 2012, ran out once the team lost the American League Division Series. the Indians will surely give him a $17.4 million qualifying offer. (they can do so on November 6 and then Santana has until November 16 to accept it.) but while Santana has stated that the Tribe is his family and he wants to stay here, he may change his mind if he thinks he can receive a multi-year deal and more money with another team. Bryan Shaw finished his five-year tenure with the Indians and what a job he did. it's his right to now experience free agency and see if he can get a big payday elsewhere, which i believe he will. the Indians won't extend a qualifying offer to Shaw, but could possibly attempt to negotiate a new contract. this is a guy who made more appearances than any reliever in baseball since 2013. that's not easy to replace with only one person and that's someone whom another team will give a lot of money to. we will realize next season when he's gone just how reliable he actually was and be sorry he left. the Indians took a chance on Austin Jackson, who was trying to come back from the surgery he had last year for a torn left meniscus, by signing him to a one-year, minor league deal in the offseason for up to $5.5 million ($1.5 mill base, $4 mill in incentives). lucky for him, he ended up opening the year with the Tribe. the risk paid off because even though he had some (other) minor ailments throughout the season, Jackson was an integral piece of the outfield, especially when several OFs went out with injuries. he proved to everyone that his knee was fine and that he can still play, so he's probably in line for a nice multi-year contract with somebody, but it won't be with Cleveland. he won't be getting a qualifying offer from the Indians either. the Tribe acquired Joe Smith during the season on July 31 after trading minor league left-handed pitcher Thomas Pannone and 2nd baseman Samad Taylor to the Toronto Blue Jays. neither prospect was ranked in the Top 30, but i was disappointed to see Pannone in the deal because he'd been doing really well this year and showing a lot of promise. for a two-month rental, i don't know if Smitty was worth it. sorry. Smith was added to the 25-man roster on August 1 and became an important part of the bullpen. while Smith was very happy to be back with the Tribe, i'm not sure if the reunion will be short-lived or if the Indians will offer him a contract to return in 2018 and/or beyond. he is ineligible for a qualifying offer because he did not spend the entire season with the team, nor does he warrant one from us anyway. Jay Bruce joined the Indians thanks to Michael Brantley's right ankle woes. the deal with the New York Mets was done on August 9 and cost the Tribe right-handed pitcher Ryder Ryan from Single A Lake County and $3.7 million. Bruce was added to the 25-man roster on August 10 and became the team's regular right fielder. rumor has it he is now looking for a deal in the four-year, $60 million range and he is definitely not going to get that from the Indians. he's also not going to get a qualifying offer because he's not eligible for one either. Boone Logan was signed by the Tribe in early February to a one-year, $5.5 million deal with a $7 million option or $1 million buyout for 2018. because he strained his left latissimus dorsi muscle in July, missed almost the entire second half of the season, and decided against having surgery, there is no way he's coming back next year. Craig Breslow signed a minor league deal with the Tribe on August 4 and his arrival to the Indians came on August 26. he was pretty much just bullpen backup and won't be returning. many more details about these players' performances with the Indians this year can be found within the Analyzing the Players section below. this is what you really came here to see, am i right? now i am going to give my analyzations of each individual player who played with the Indians in 2017--even the ones you may have forgotten about. i'm also going to include short performance summaries for those who were on the 25-man postseason roster. i'm separating the guys based on outfielders, DH, infielders, utility, catchers, starting pitchers, and bullpen pitchers. if a player played multiple positions this year, i listed him under the category where he played the most. i decided to use some emojis at the end of my evaluations to describe my feelings as well. and remember, the italicized parts are (portions of) what i wrote about the boys in the preseason blog, which i added here merely to compare. --Jackson proved to everyone that after his June 2016 surgery for a torn meniscus in his left knee, he is healthy again. he got a late start to playing in Cactus League games, but when he did, he showed no signs of a setback. in total, he got 33 at bats in 13 games, hitting six doubles and one home run. he also had eight RBI. his one drawback is he's probably going to whiff a bunch, too. this spring he had 10 strikeouts and just three walks. furthermore, he recorded one outfield assist. he could potentially be like an equivalent for Davis because he's great in center field and has some speed, although i surely don't expect him to steal like Davis did last year. i'm happy A-Jax made our big league team, i feel that was the right choice, and i hope he does some good things for us this season. --Tyler Naquin had another superb spring in spite of some bad luck. he fouled a ball off his foot during one game, then later was sidelined for a few days with bilateral knee soreness. his ailments could have been the reason why he cooled off after a very hot start. of his final five games, he went hitless in four. but overall, he hit five doubles and one homer, drove in five, and bat .333 in 39 at bats. in the outfield, he also attained one assist. it's been suggested that Naquin could possibly see time in right field this year if needed, and he's also going to face more left-handed pitching. so that will be interesting. --early on in spring, Brandon Guyer had minor right hamstring soreness, which delayed his appearance in Cactus League games. he also had the flu for a short period of time. when he did play, he had a good camp--six RBI, one double, two home runs, four walks in 14 games. and of course, he got hit by three pitches, the most in spring. but you really can't complain about those stats from a platoon outfielder. although, Francona did publicize that he plans on playing Guyer more against right-handed pitchers this season because he thinks that will help him become an even better hitter against lefties. we'll see. --thankfully, we did not discover any discouraging news about Abraham Almonte this spring. (say no to drugs, kids lol) he had one of the better camps of all the regulars, yet he made the OD roster purely because Chiz is opening on the DL, which to me seems absurd. he can play all three OF spots; wouldn't you choose him for your squad independent of other players' health? he bat .352 in spring, hit four doubles and three home runs, drove in 12, walked six times, and even stole three bases. in addition, he had a 12-game hitting streak, which was the longest streak by an Indians player in the spring since Asdrubal Cabrera's 13-gamer in 2011. defensively, he acquired himself an outfield assist as well. i was abundantly pleased with what i saw from him in spring and i pray he's not the one who gets demoted when Chiz comes off the disabled list. --Lonnie Chisenhall looked to be having a nice spring until he ran into a wall--literally. a week before camp was supposed to break, Chiz ended up with a mild sprain of the AC joint in his right shoulder after attempting to catch a ball and smacking into the right field wall at Sloan Park in Mesa, Arizona. he was shut down for three days and, following his re-evaluation, he was told he would be opening the year on the DL. prior to that, Chiz obtained five extra base hits, including two home runs, and six RBI. he also played a couple games in center field and did well. he's not expected to miss too much time; in fact, the team believes he will only be out for the first week (road trip) of the regular season. --Daniel Robertson's spring went very well. he had 61 total ABs, the most out of everyone. he bat .328 in 25 games and hit two doubles, a team high two triples, and one home run. he also scored 13 runs and drove in nine. he even acquired one outfield assist and was part of a double play. unfortunately, he left the last game he was in early after seemingly injuring his hamstring, but not before going 3-for-4 with three RBI. irrespective of that, i'm unsure if he'll ever get to Cleveland this season. --Bradley Zimmer was another one of the stars of the spring, no question. except there was no room for Zimmer when it came time for the Indians to establish their 25-man roster. he got a lot of playing time with the Tribe, going 19-for-53 and batting .358 with five doubles, one triple, three homers, 14 RBI, team high four stolen bases, and team high 35 total bases. his lone blemish was one error in the outfield. he literally could not have done more, but could stand to play in Triple A for a while prior to joining the big leaguers. and i can see him being called up sometime this year. --Greg Allen did not do as well as Zimmer and new Major Leaguer Diaz, but for all intents and purposes, he had a successful camp with the Indians. he had 11 hits, three of which were doubles, two RBI, and three stolen bases. he played the most time in the outfield between he, Zimmer, and Diaz, and had a perfect 1.000 fielding percentage. he'll likely be the last of this trio to debut in Cleveland, but he's definitely someone to keep an eye on down in Akron. --newbie Encarnacion had a good camp, batting .311 (14-for-45) overall, but in the beginning he was mostly hitting what i called a lot of weak singles. according to Terry Pluto, he's not normally a great hitter in the spring, so i guess we shouldn't panic because he mainly hit his home runs in BP. that's right, the big bopper didn't hit any bombs in Cactus League play until the very last spring game on March 31. his other extra base hits were doubles (five) and he had a total of seven RBI. he also struck out 19 times, which is something we'll simply have to live with. defensively, he made one error at 1st base, but Francona disclosed EE will DH more than play 1st base in the regular season. --Santana spent a significant amount of spring away from the Tribe while playing for Team Dominican Republic in the WBC. before he left, he wasn't hitting much, but when he was in the tournament, he did well. and that continued when he rejoined the Indians. in 12 games, he finished 10-for-38 (.263) with four doubles, one home run, and four RBI. he's going to play a lot more 1st base this year than last season, so said Tito, and may also play in right field when the team plays in National League parks. i think he's ready and could rival his career high HR total from 2016. --Jose Ramirez got the Indians' first hit of the spring this year and he played the most out of all the starters. he also got a five-year, $26 million contract extension. (one good season and they gave him a better deal than Brantley got before he even proved he could do it again? that's a dope agent Jose has lol) overall, he had a great spring, batting .304 with seven doubles (team high), one homer, and seven RBI, but his strikeouts were a little high (nine in 56 ABs) compared to what we saw from him last year. he began camp playing 3rd base, then had to move over and play 2nd once Kipnis went down with his shoulder pain. and the Indians have decided he will be Kip's replacement at 2nd, marking the third straight year that he doesn't open up the season at 3rd. but if you didn't know, 2nd base was actually his "natural" position, so his defense there shouldn't be a hindrance. case in point, he had no errors anywhere on the infield this spring. (and Tito already specified he's not planning on putting Ramirez in the outfield this year, fyi.) i'm still a bit skeptical that his bat will continue to be hot. i need to see it in order to believe that he's not a one-year wonder. --Francisco Lindor went all the way to the championship game of the WBC with Team Puerto Rico. he played A LOT for them and was one of their best offensive players. if you combine his stats from that and his spring with the Tribe, then nothing looks out of the ordinary, but truthfully, he did a lot better during the tournament. overall in Cactus League play, he bat .229 (8-for-35) with two doubles, one home run, and four RBI in 11 games. his sole error came very early on in camp. otherwise, he showed off his skills at short with a number of his routine outstanding defensive plays. he's as ready as he's ever gonna be for the regular season and i'm confident that he's going to have another spectacular year with both his bat and his glove. --Yandy Diaz, welcome to The Show! he was certainly the star of spring. he put together a performance much like Naquin did during ST 2016, batting .458 (22-for-48) with four doubles, one triple, two homers, a team high 15 RBI, and team high eight walks. he also had a team high 22 hits in 20 games and went 2-for-3 in each of his last four games. the only negative from his camp was that he missed a little time with a groin injury. i was amazed that he made the OD roster because of his current questionable defense. besides that, it's unknown as to whether or not his hot bat will remain as such in the cold Cleveland April weather. the Tribe doesn't typically allow first timers to debut right out of camp because there's a high probability they will start slow and lose confidence. i admit, i am nervous that that may happen with Diaz. i know everyone was rallying for him to make the team, and therefore my reservations will be met with incredulousness. sorry. --Jason Kipnis is still a ways away from playing with the Indians. when he first got to Goodyear, the team mentioned that he was on a "special" throwing program to build strength in his shoulder. then when spring games began, it came out that he felt discomfort when he was throwing the ball and had a strained right rotator cuff. he received a cortisone shot and was shut down for five days before resuming throwing. on March 9, he made his Cactus League debut as the DH, but was shut down again on March 12 for two weeks because of the strain. then a week later it was announced that Kip would be out 4-5 weeks and starting the season on the disabled list because of inflammation. many fans are equating Kip to Brantley, which i don't understand because those are two, well actually three, entirely different issues. Kipnis seems to only have pain with throwing, as he did go 2-for-5 at the plate in his two spring games. hopefully the extra rest will take care of the problem and nothing lingers into the season. --Giovanny Urshela took part in the WBC with Team Columbia, but he didn't miss much time with the Indians because his team didn't advance very far. he had a decent camp offensively, finishing with two doubles, two homers (one being a grand slam), and seven RBI. still, the Tribe decided to give Diaz the temporary spot at 3rd base until Kip comes back and Ramirez returns to the hot corner. i was taken aback by that decision because we know Urshela is consistently solid with his defense, which cannot be said for Diaz (yet). once toted as a top prospect in the organization, Ursh has not played in the bigs since 2015. and now i'm beginning to wonder if there's even a place for him with the Indians anymore. is it possible that his time has already come and gone? might his name end up on the trading table someday soon? --Michael Martinez is not a favorite among Indians fans, i know. but the guy is a utility player and Francona loves him. and he actually had a pretty productive spring, batting .345 (20-for-58) with five doubles, one triple, one home run, and nine RBI. he mostly played 2nd base, but appeared in three games in the OF and obtained one assist. Martinez generally does not perform even close to this level during the regular season, so it's hard to get hyped about him. he may not stay on the big league squad the whole year and could be sent down and called up repeatedly as needed. --Erik Gonzalez (infielder) had what should be a confidence-boosting camp, especially after his struggles on the Indians last year. he bat .308 with two doubles, one triple, two homers, and 11 RBI, but he did strike out 19 times versus drawing only one walk. in addition, he committed two errors in 29 chances. towards the end of spring training, he was hit in the hand and then sat out some games. he's turning into a utility type player so the Tribe will have more options of where they can put him, but what he will bring to the team offensively remains unclear. the reason Martinez made the team over him, aside from all of MM's big league experience and versatility, is that the Indians wanted Gonzo to play every day, which he wouldn't in Cleveland. maybe we'll see him get called up later in the summer. --Gomes had a tremendous spring and i think, after how his 2016 played out, he needed that. batting .370, he had six doubles, three homers, and seven RBI, and his nine extra base hits were the most out of all the guys in Major League camp. more importantly, his arm already appears to be in mid-season form, as he threw out (a catcher's high) four runners trying to steal, including two in one game. maybe now Gomes can put his past misfortunes behind him and be a valuable contributor in the lineup this year. --Roberto Perez missed most of spring because he was part of Team Puerto Rico in the WBC, though he did have a few good games before he left. Perez only appeared in two games with his country's team and i personally think it was kind of a waste for him to be there for over two weeks. he needed the most practice out of everyone since he's never been that great with the bat. be that as it may, he did end up hitting .304 (7-for-23) for the Tribe with two doubles, two RBI, five walks, and one stolen base in 10 games. his skills behind the plate seem sharp, and his arm looked great, too, as he threw out three baserunners. with any luck, we'll get a little more out of his bat this season than we have in the past. **edit: on April 2, the Indians signed Perez to a $9 million, four-year extension with club options for 2021 and 2022. congrats! --catcher Francisco Mejia played with the Tribe for a little bit until he was optioned to Double A Akron on March 15 and he did quite well. he appeared in 11 games and bat .421 (8-for-19) with one double, two home runs (including one GRAND SLAM), and eight RBI. even with him mainly coming in later in games and not facing top tier Major League pitching, that's pretty extraordinary for a kid and i know it was a very valuable experience for him, too. he's one of our top prospects for a reason and i'm looking forward to his debut in Cleveland (which probably won't be until at least 2018). let me highlight the pitching as a whole on this club for a minute because even though some things fell apart in the postseason, Cleveland's pitching has become one of the best in baseball, and it's been that way for years. for the fourth time in club history, two pitchers--Corey Kluber and Carlos Carrasco--totaled 200 Ks in the same season. the last time this occurred was in 2015, when the same duo first did it. on September 29, Kluber, Carrasco, and Trevor Bauer became the first trio in MLB history with 17+ wins and 190+ Ks. no questions here this year. our starting five was set long before anyone even reported to spring training. Corey Kluber is the ace, Carlos Carrasco is #2, and Danny Salazar is #3. as for the last two, Terry Francona has gotten on board with my preferred order of Josh Tomlin #4 and Trevor Bauer #5. (actually, he insisted he ordered them that way due to early season pitching matchups, but still, i like it. i like it a lot.) like last season, the Indians have a couple off days early on in April, but Tito vowed that everyone would be pitching in order and no one would be skipped, at least not in the first week. it is possible that one of the starters ends up as a temporary option in the bullpen somewhere down the road though. i know the ERAs of all our starters aren't exactly desirable, but i can say with confidence that they all have great stuff and there were definite flashes of how dominating they can be when everything comes together. again, pitching can be more arduous in Arizona, so the final numbers aren't necessarily red flags. if everyone can maintain their health, then this is one of the most intimidating starting 5s in the league, hands down. --Kluber was brought along slowly this spring because he pitched the most out of any starter in the 2016 playoffs. he didn't pitch in a Cactus League game until March 6 and was rusty. as spring went on, however, he began to hone in on his pitches and the strikeouts kept piling up. in five games and 23.1 innings, he struck out 28. on the downside, he gave up 18 runs and four homers, three of which came in his final spring start. he also walked seven and acquired an earned run average of 6.17. but he will be the Tribe's Opening Day starter and he's ready. he's in good shape and after a very heavy workload last year, his arm feels good. if past seasons are any indication, then we might see him struggle in a few outings early on, but it won't last. the Klubot will be activated eventually and then it's lights out for the hitters he faces. --Carrasco had some right elbow soreness and inflammation that kind of came out of nowhere. one day, he couldn't throw his breaking ball without pain and gave up three home runs, including one grand slam, and eight runs in just 1.2 innings. after a little downtime and a short paternity leave, he returned and threw all his pitches again with no complaints. once he completed his final start, he'd appeared in six total games, pitching 15.0 innings, and had a 10.80 ERA with a record of 2 wins and 2 losses. overall, he gave up seven homers and walked four, but also struck out 13 batters. he didn't accumulate the number of innings in spring that the team wanted, he only pitched about half as much, and will probably be limited to pitching 4 or 5 innings in his first couple starts. the jury's still out on if his elbow truly is okay, but i have no reason to believe it's not until we hear otherwise. --Salazar had one bad start due to control issues and that skewered some of his overall spring stats. he only allowed one home run until his last start, in which he gave up two homers to the same player. he finished with a 4.85 ERA, went 2-1, and walked a team high 14, but also struck out a team high 37 batters! furthermore, he pitched a team high 26.0 innings in seven appearances. this was the best spring i've seen from him. he had his fastball working and when that's good, his offspeed stuff (his changeup) is also good. if he can stay healthy, he's going to have a hell of a year, i know it. --Tomlin, like Kluber, was given a little more time to get himself ready for spring games because of his number of playoff appearances as well. the first spring game he started was on March 9 and he pitched a skilled 3.2 innings. it looked like he hadn't missed a beat since his last outing in 2016 and had picked up right where he left off. he had a few rough starts following his debut though, particularly his final one, when he gave up four home runs in 7.0 total innings. maybe it was due to him being stretched out more, i don't know. Francona didn't seem bothered by it. speaking of, Tomlin did not pitch for the Tribe in the last week of spring. the Indians opted not to have him pitch at Chase Field against the Arizona Diamondbacks because he's scheduled to pitch against them in his first regular season start. therefore, he made four total starts in spring, the least of everyone. he finished with a 5.50 ERA, allowing 13 runs and seven home runs. conversely, in typical Tomlin fashion, he did not walk anybody. i reckon he's gonna be fine once he's out of the desert. --Bauer was classic Bauer this spring. what i mean by that is, after a very short break from baseball, he spent the majority of his offseason preparing for 2017. that included adding another pitch to his repertoire, known as a split-finger fastball. did he really need another pitch though? nonetheless, he had a good spring, finishing with the lowest ERA of all the starters (4.74) and a 3-0 record. in six starts, he pitched 24.2 innings, the second most of everyone in the rotation, and acquired 18 strikeouts. he also gave up five home runs and allowed six walks. just like Tomlin, he did not pitch in an Indians game in the final week of spring, but he and Tomlin both pitched in a minor league game on March 31 to get their last bit of work in before the regular season. --Mike Clevinger couldn't locate his fastball in his first start with the Indians, and he may have been partially distracted in his final start that came shortly before his wife gave birth to his second daughter. overall, he didn't have the flashiest spring, but had a 2-1 record. he made five appearances and finished with an 11.12 ERA in 5.1 innings. he also allowed two home runs and walked eight, but i'm not worried about him. while in camp, he worked on minimizing the tap of his lead foot before throwing his pitches. Clevinger will likely be the first guy called up if something happens to anyone in our current starting 5 thanks to the experience he gained in the bigs last season. --Ryan Merritt will be known around Cleveland as the hero of the 2016 American League Championship Series for a while. the southpaw started the Tribe's first Cactus League game this year and had some difficulty. he appeared in four games before being optioned to Columbus, performing best in his last two. all-in-all, he gave up eight runs, one homer, and two walks while striking out seven in 8.1 innings. i think he'll provide good depth for us if needed at some point this year. --Adam Plutko had an excellent spring in four outings with the Tribe. he amassed 10 strikeouts while only giving up one run in 8.0 innings pitched, and was also credited with two saves. i don't know if he'll see time in Cleveland as a starter this season, but he may join them in the bullpen down the road like last year. --Shawn Morimando also made four appearances with the Indians in spring, including one start on a split squad day. his final numbers were nothing to write home about, although he didn't allow any home runs. he gave up six runs on 12 hits, walked two, and struck out 11 in 8.2 innings. he needs more time in Triple A to work on his stuff before he's ready to be a fixture in the big leagues. but he should be a promising future option. in 2017, the Indians bullpen registered a 2.89 ERA, which was tops in the majors. (source: Jordan Bastian.) even so, the relievers were directly responsible for 24 of the team's 60 total regular season losses. i always consider a loss to be the bullpen's fault if 1.) the Indians are in the lead and then a reliever blows the lead, and 2.) the game is tied when a reliever comes in and then he cannot hold the tie. this year, relievers blew the lead five times and could not keep the game tied 19 times (and the bats couldn't rally a comeback). in five American League Division Series games versus the New York Yankees, the bullpen was only accountable for one of the three losses. it occurred in Game 3, when Andrew Miller gave up a solo home run to break a scoreless tie, and the Tribe ended up losing, 1-0.
coming into camp, our bullpen was almost completely filled. spots were already occupied by Cody Allen, Andrew Miller, Bryan Shaw, Zach McAllister, Dan Otero, and Boone Logan. and once we got to the end of spring training, it was revealed that Shawn Armstrong would also be making the roster and pitching in relief for us, at least for the start of the season anyway. --due to their workload in the playoffs, Allen and Shaw were brought on a little more slowly. neither appeared in a game until March 5. Allen pitched a total of 8.2 innings in nine games, gave up four runs on six hits, and struck out eight. he had one categorically bad outing, when he gave up three runs and was charged with a blown save. other than that, our closer looks ready to go. --Shaw of course stayed true to form and had his annual underwhelming spring. he was still working on things right up through his last appearance in the final game, which was one of his worst. overall, he allowed 19 hits, 16 runs, but only two homers in nine games and 7.2 innings. he finished with a paltry 17.61 ERA. Francona did not seem concerned, assuring the media that the ball was coming out of his hand good, he just wasn't locating. but is that really all it is? every year we wonder, is this going to be the year all those innings from previous seasons catch up to him? but then he goes out there and, aside from a few stinkers, is one of the more reliable pitchers in the 'pen, especially as he racks up innings on his stats sheet. so how can i expect anything else from him right now? --Miller also should have taken things easy at the start of spring, but he had to get ready for the World Baseball Classic. his first outing in the WBC was not good--he gave up TWO home runs and the internet practically blew up. yet in his first game back with the Tribe, he looked like his usual self. overall, he pitched 7.0 innings in seven games and had a 5.14 ERA, giving up two homers and striking out eight hitters. i'm not worried and i anticipate he will set a strikeout record this year. --McAllister was the only reliever to get stretched out for the purpose of possibly making a spot start during the regular season. he started one spring game and, in what was probably his poorest appearance, he allowed five hits and two home runs in 2.0 innings. in spite of that, i believe he's primed and ready to be another staple of the bullpen. he pitched 11.2 innings in nine total games, striking out 12 batters and walking just one. he surrendered three homers overall and earned one save. in general, he pitches very well unless he's hurt, so remember that if McAllister is ever largely inefficient on the mound for several consecutive games this year. --Otero had the best spring out of everyone. he started off very strong and didn't give up a run until his 9th appearance on March 26. prior to that, he had 8.2 clean innings of work. he finished right behind McAllister for most innings pitched with 11.1. in 11 games, he gave up two walks, no homers, and just the one run. he also struck out five and had a 0.79 ERA. fantastic. --Logan got roughed up after his first outing and had some more struggles along the way. he was also apparently continuing to work on stuff, right up to the final Cactus League game. when spring ended, he had a 9.90 ERA in 11 appearances and 10.0 innings. he gave up 11 runs, two homers, and four walks, but he did strike out 14. i didn't get a sense of dependability from him and i worry that his $5.5 million deal was a mistake. to be honest, i would say right now he's the weak link in our bullpen, though he may not be that weak. it's probable that he can become a dominant second left-hander in the pen to get out lefty hitters. --Armstrong was pretty much equal with Otero in terms of effectiveness. he did a lot in the offseason to make improvements and it showed in spring. he worked on his mechanics, used weighted balls to train, and increased his bullpen work. he also kept in touch with pitching coach Mickey Callaway. he didn't give up a run until his 9th appearance on March 27 after 9.1 perfect innings. he finished with two runs allowed, three walks, 10 strikeouts, and 10.2 IP in 11 games. he also compiled a 2-1 record and 0.84 ERA. moreover, the Tribe tried to stretch him out so that he could pitch in multiple innings this year. he was my preference to complete the bullpen because he really seemed to be locked in this spring. he's had some success with us in the past, so here's hoping that continues. --Nick Goody had a very strong spring, finishing with a 0.90 ERA before being optioned to Columbus. he appeared in 10 Cactus League games, pitched a total of 10.0 innings, and induced 11 strikeouts. he allowed a mere one run while walking three. Francona outwardly stated that he would have made the team if they were going with an 8-man bullpen. Goody will probably be the first reliever called up when the Indians need a fresh arm or perhaps have an open roster spot, and i think he will definitely be helpful in our bullpen. --Kyle Crockett had one of the better springs out of all the relievers and was a contender to get that final spot in the bullpen right up until the last week. (although, i think the writing was on the wall for the lefty when Logan got signed.) in 10 outings and 10.0 innings, he struck out 13 and didn't walk a batter. he gave up three runs on nine hits and did not allow any homers. he also earned one save in two opportunities. he looked like the Crockett i always thought he would be, but never seems to be when he's actually on the Major League team. evidently, he pitches best when he gets rest in between appearances, but that won't always be the case in the majors and that's presumably why he hasn't done consistently well during his time with the Indians. --Tyler Olson pretty much lost his shot to begin the year with the Indians once they signed lefty Logan, which is a real shame because he had the much better spring of the two. in 11 games, he gave up three runs, one home run, and six walks. he struck out 11 in 10.2 innings, earned a save, and acquired a 2.53 ERA. i expect him to get at least one call up this season. --Joe Colon's 19.80 ERA looks horrible, but he only pitched in five spring games with the Tribe. in an early outing, he allowed six runs and two home runs in 1.0 inning. he spent a lot of time away from the club while taking part in the WBC with Team Puerto Rico, which basically ruined his chance of making the roster. in his first appearance back from the WBC, he gave up a grand slam in the 9th inning and blew a game for us. knowing him from last season, i can confirm he's better than that, but clearly needs some time to work out his kinks. time to recognize those who were the most valuable players on the team this year. Kluber is going to win another Cy Young for his performance even though he missed a month with his lower back strain. Carrasco came into his own this season and pitched like an ace as well. and the star of the bullpen in 2017 was unquestionably Mr. Olson! he didn't get called up until the second half, but he pitched a perfect 20.0 innings and that can't be ignored. Ramirez, Lindor, and Encarnacion are getting the nod from me on the offensive side of things. Ramirez had a couple bad months, but enough hot ones so that the bads didn't hurt his total stats. Lindor got pull happy and had a rough patch, but he figured it out after the All Star Break and finished up strong. and EE ended up with the big HR and RBI numbers that we anticipated we'd see from him. i'm giving this honor to Bruce and Perez for their bats. and the pitchers who really stuck out to me are Carrasco, Tomlin, and Smith. now i'm gonna take a minute to acknowledge the players who either didn't do well this year or had too many injuries that (negatively) affected their season. i'll start with Chisenhall. when he first came off the DL, he was doing so well, but then a calf injury kept him out for most of the second half. Kipnis also had issues throughout the year with a hamstring strain and barely played half the season. i won't be a homer, i'm putting Brantley in here, too, because of the 50 games he missed in August and September with that "mild" ankle sprain. after making the All Star Team, that was a huge blow for Dr. Smooth. he would have been the AL Comeback Player of the Year if not for that injury. Guyer has to be included in this category as well because his wrist sprain prevented him from being able to do the job he's supposed to do--hit left-handed pitching. he never really got into the swing of things to start with, and then having to miss time with the wrist problem threw his game all off. Encarnacion just got shut down offensively and i don't think the ankle had anything to do with that. for the amount of money he got paid to come here and produce, he was a disappointment in the ALDS. i also have to name the Top 3 in the batting order--Lindor, Kip, and Ramirez. going 8-for-60 at the plate with 21 strikeouts in five games is no bueno. especially Ramirez because that guy's likely going to get a lot of MVP votes, so to not be able to hit in the postseason was quite unsatisfying. and i know there is still some mystery surrounding Kluber's performance, but regardless of if he was hurt, when your ace can't even get through 4 innings in a game, that is a serious letdown. do you agree with my picks? enlighten me with your thoughts on who excelled and who bombed in a comment below. and with that, i'm closing the book on 2017. it was a year that began with so much promise, then ended horribly. i know a lot of us believed we'd be playing in our second straight World Series this postseason. i certainly knew the competition to get there would be tough, but i never doubted that we'd get there. sigh. at least most of the team is under contract for next year, so hopefully we can make another run at it. Go Tribe 2018! 145 days left until Opening Day! Corey Kluber Wins BBWAA's 2017 AL Cy Young Award!